What happened to our Eleanor Georgina Armstrong? was BORN 20 March 1859 in Coxtown, Donegal, Ireland to Anne Beatty & William Armstrong, Sr.
*(UPDATE 5.19.15) Eleanor Armstrong (Wells) record located in Pennsylvania! Eleanor Emigrated to the United States in 1880. 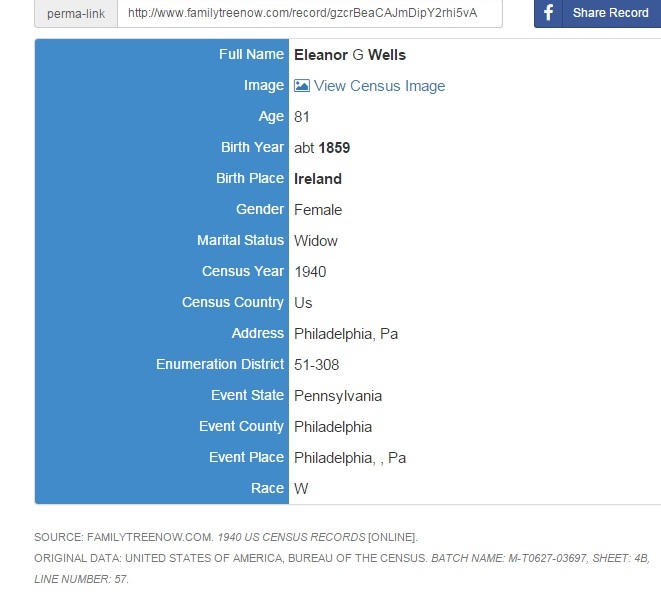 On Oct.30, 1886 she was present at the Christening of Elisabeth & Edward Magee's daughter (Ellen, named after Eleanor) also in Philadelphia, Pa. She married John (Henry) Wells who was also a resident of Philadelphia in 1888, but they had no children & shevwas widowed before the Philadelphia Census of 1910 which states she was then working as a Cleaner. Her sister Elisabeth (Armstrong) Magee also lived in Philadelphia with her family & has also been located on the 1900, 1930, & 1940 Philadelphia Census. 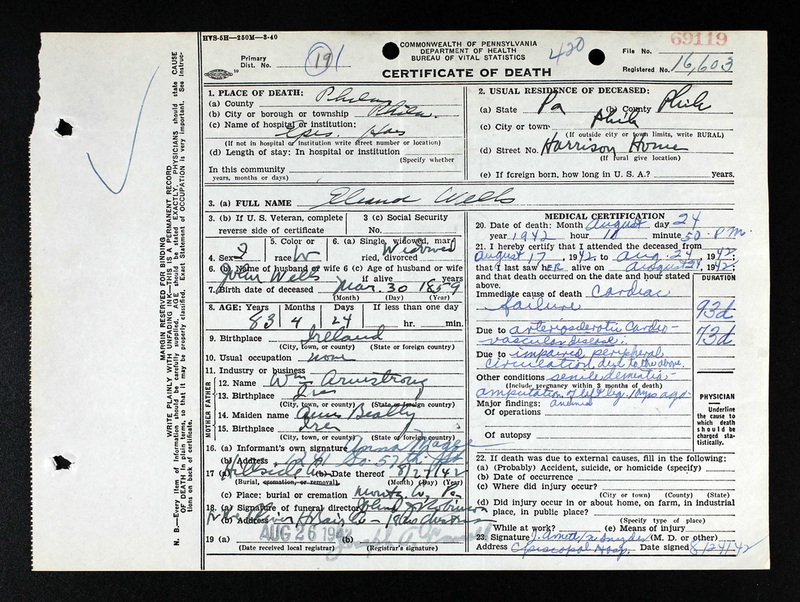 The same Census Records of 1930 & 1940 show that Eleanor was living at the Hospital of the Protestant Episcopal Church in Philadelphia prior to her death on August 24th,1942, which is actually the same year her sister Elisabeth Died. I suspect it was prior to August since Anna Magee (Elisabeth's daughter) signed the death certificate of Eleanor. So far, we have not locate her grave in Pennsylvania. "We believe it is because of the Family Search Indexing program, this record finally came to light." As a point of interest, ANGIE has indexed over 17,000 names (Census in many states of the USA, Canada 1881 Census, UK, England & Wales Census 1871, Philipines, Ghana 1984, and the Jamaica Civil Marriages and Death records, to name a few), and she has Arbitrated over 30,000 names.